The framework agreement on Iran's nuclear program is set to refill Iran's coffers and enable the Islamic Republic to invest considerable treasure in its regional network of terrorist and guerilla proxies. The deal between Tehran and the P5+1 countries, which must be finalized by June 30, has generated intense debate over whether it goes far enough to curb Iran's nuclear ambitions. Yet, aside from these controversies, its short-term impact on the Middle East looks bleak. Promised relief from crippling economic sanctions will soon place Iran in a far better position to finance its extensive list of clients and activate them to subvert, destabilize, and spread conflict and mayhem across the region. They include the Shi'ite Lebanese organization Hizballah – the most highly armed terrorist entity in the world, active in the Syrian civil war – the Shi'ite Houthi forces currently seizing and destabilizing Yemen, a plethora of militant Shi'ite militias in Iraq, the Islamic Jihad terror group in Gaza and the West Bank, and Hamas, with which Iran has recently mended relations. Iran has begun sending Hamas, which rules over Gaza, tens of millions of dollars for its combat tunnel reconstruction and rocket manufacturing programs. The Iranian investment in Gaza's Islamist war capabilities will only rise after sanctions are lifted. Iran will also be able to use the money to boost its partners, who are increasingly reliant on its aid, and which are subject to Iranian directives. Iranian regional partners include the Assad regime in Syria, which has killed enormous numbers of innocent civilians in the country's civil war, and the Shi'ite Iraqi government, dependent on Iranian support in the war against the Islamic State. Once international sanctions are lifted, Iran stands to secure over $100 billion in unfrozen funds in foreign exchange assets around the world. Soon afterwards, international companies are expected to rush into Iran to invest, and oil sales will resume, generating huge new revenue sources. The Islamic Republic will, without question, siphon off a part of that money to its various tentacles abroad, providing them with cash, training, and array of weapons, such as guided rockets and missiles for Hizballah, firearms and projectile capabilities to militias in Iraq and Yemen, and missiles for the Assad regime in Syria. Iran continued this activity despite the sanctions in recent years, so it stands to reason that it will accelerate dramatically if Tehran finds itself flush with cash. Iran will also attempt to subvert and destabilize U.S.-allied Arab states, led by Saudi Arabia and Egypt. Like many aspects of the nuclear deal reached in Switzerland last Thursday, the details of when and how the United Nations Security Council will cancel sanctions on Iran remains unclear, with Iran claiming the sanctions will all be removed immediately, while representatives of the P5+1 countries offer alternative accounts. These conflicting narratives are minor; the fact is that sanctions will soon be removed if the deal turns into a signed agreement. The Iranian Revolutionary Guards Corps and its extraterritorial special ops Quds Force unit are active throughout the region, setting up proxies, arming them, and expanding their bases of operation. Hizballah chief Hassan Nasrallah has acknowledged the impact of lifting the sanctions on Iran, telling a Syrian television channel on Monday that the deal will "strengthen Tehran's role in the region." "Iran will become richer and wealthier and will also become more influential," Nasrallah told Syria's Al-Ekhbariya TV. "This will also reinforce the position of its allies." "A stronger and wealthier Iran, in the coming phase, will be able to stand by its allies, and especially the Palestinian resistance, more than at any other time in history," Nasrallah stated. Thus, Iran's role as the No. 1 state sponsor of terrorism is about to grow. Aside from the implications of sanctions relief, the framework agreement's loopholes seem big enough to allow Iran to remain a threshold nuclear breakout state. The nuclear deal deactivates, but does not destroy, 13,000 uranium enrichment centrifuges at the Natanz and Fordow nuclear sites, both of which will remain open. It leaves 6,000 functioning uranium centrifuges in Iranian possession. Disturbingly, the agreement fails to restrict Iranian research and development on faster, more effective uranium centrifuges – knowledge that can be used in the future to break-out to the nuclear weapons productions stage. The Iranian ballistic missile production and development program that produces the delivery mechanism for future nuclear weapons is untouched by the deal. 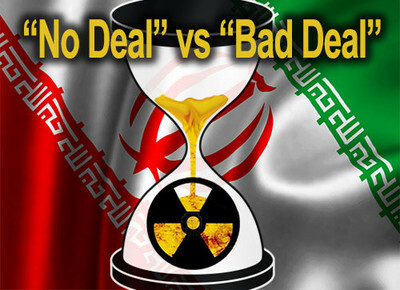 Additionally, the deal in its present form is vague about the intrusive inspections needed to monitor Iran's activities. In the shadow of the expected boost to Iran's regional standing, Sunni states, led by Saudi Arabia, decided to take matters into their own hands and launch Operation Decisive Storm in Yemen. This air campaign, backed by Egyptian naval support, is designed to beat back the Iranian-backed Shi'ite Houthi rebels, who are on the verge of seizing Yemen, including the strategic Bab Al-Mandeb shipping lane, through which a significant portion of the world's oil flows. The operation is also a message by regional states threatened by Iran's expansionist designs, that they will not sit by idly. Israel, for its part, has declared that it is not obligated by the deal, and its leaders have already indicated clearly that if a critical Iranian transgression is detected, the military option remains firmly on the table. Some voices in Israel back the deal, including former Mossad chief Efraim Halevy. Halevy said the framework agreement "proves that Tehran capitulated by agreeing to conduct negotiations about its plans and the nuclear infrastructure it has built up for years, primarily in secret," and forcing Iran to curtail its programs, destroy valuable equipment, and drastically reduce the number of centrifuges. Iran was forced "to agree to an unprecedented regime of international supervision and monitoring of its nuclear facilities and the dismantling of critical systems," Halevy said. Current Israeli government officials reject that assessment. Minister for Intelligence Affairs Yuval Steinitz said in recent media interviews that Iran will be able to manufacture atomic bombs in "zero time" when the agreement expires in 10 to 15 years [the expiration date is, as of yet, undefined]. Responding to President Obama's claim that the agreement provides the West with an insurance policy against a nuclear Iran for at least a decade, Steinitz said the agreement, with its current numerous loopholes, does not provide such a guarantee even for a year.